R2T:185 My Day With Oprah – Real. Raw. Truths. As you listen to this podcast I will be attending Oprah’s supersoul session 3 live in los angeles gaining insights from Oprah, Tony Robbins, Gabby Bernstein, Glennon Doyle Melton, John Gray, Wes Moor, Angela Davis and Gary Zukav. 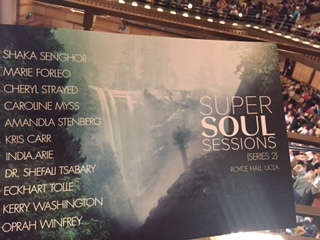 As I get ready to attend this event again, I am reflecting on the lessons I took from last years Supersoul Sessions event. I am sharing these lessons with you knowing they may be what you need to know, and may not know it. The fact that you are listening today may be a sign. Oprah and her roster of thought leaders delivered more than I could have expected. The blind spots shown to me were exactly the lessons I needed to focus on. Oprah’s purpose in having live Supersoul sessions is to help stimulate and inspire each of us to move in the direction of our truest highest calling. To leave feeling full and to move out to the world to claim our power and to be more of who we are! Enjoy my lessons, and share with your network and with anyone you feel may not know they need to hear them. Stay tuned for 2017 blog and podcast after the event! !